For the first time, all 61 species of scombrids (tuna, bonito, mackerel) and billfishes (swordfish and marlin) have been assessed according to IUCN Red List criteria. The good news is that 39 of the 61 species are classified as Least Concern. The bad news is that these are, for the most part, not the species being fished. Seven species are in a threatened category- either Vulnerable, Endangered, or Critically Endangered. Five of the eight species of tuna are either in one of these categories or in the almost-as-bad Near Threatened category, as are blue, white, and striped marlin. Southern bluefin are classified as critically endangered, and Atlantic bluefin are classified as endangered. Lucy Harrison, an IUCN officer and an author on this paper, said “there are some examples of successful management regimes… and managers of those threatened fishes need to look to these for ideas on how to allow their species to recover.” The authors recognized that while shutting down these fisheries entirely would do the most to rebuild stocks, the economic consequences would be great. Instead, they recommend substantial quota reductions for fishermen catching these fishes. With this study, conservationists and fisheries scientists provide even more evidence than ever before that these fishes are in serious trouble. Due to the fact that multinational fleets exploit them in international waters, even CITES proponents believe that science-based fishing quotas at the RFMO and national level are critical components to effective tuna conservation. Now, all eyes are on fisheries managers to see if they will take action in time to rebuild populations of these exceptional animals. How interesting, I never would have guessed that tuna would be endangered. This is very interesting, if you want to link up on twitter @Nikela_Wildlife we would be more than happy to help you spread the word. I am hopeful that for once ICCAT will act, but, I am not holding my breath. I’ve been working on tuna issues off and on for over five years now and ICCAT’s reluctance to act on scientific recommendations used to outrage and frustrate me, until I came to the cynical realization that ICCAT isn’t about managing for the fish, it’s always been about managing for short term benefit of the industry and fishermen. 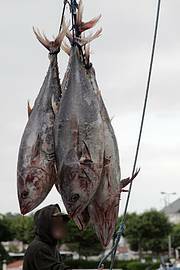 I do hope they do the right thing for both the fish and the fishermen (granted it’s long term good for the fishermen at an expense of short term hardship).